Twenty years ago I got my first taste of Shakespeare through one of my favourite plays ever: Macbeth. I memorized the whole thing for my O levels. It was wonderful to have all that beautiful language inside my head, to be recalled in snippets even years later, unexpectedly and surprisingly, yet appropriately and pictorially. For twenty years did I enjoy the words, so much so that I failed to realize one thing: I had never even seen it ONCE. Why, I can’t say. Perhaps the opportunity didn’t arise. Perhaps there was a fear of seeing a play I’d imagined hundreds of times being butchered and my memory of it forever besmirched. So when I learnt that the Singapore Repertory Theatre was going to do it, that Adrian Pang was the lead, and that it was going to be al fresco, with all the potential this setting would promise, I jumped at the chance to lose my Shakespeare-live virginity forever. Three As for Adrian, Atmosphere, Anachronism. Adrian Pang is, well Adrian Pang. He brought just the right balance of villainy and sense of internal conflict to the titular character, with appropriate degrees of intensity. Having just seen him in the play Closer, I thought he’d be hard put to match that performance, but once again he lived up to his accolades, in spades. He delivered old English confidently and with nary a stumble, and depicted the descent from glory and honour to greed and power hunger most convincingly. That’s what the setting at Fort Canning Park generated plenty of. Simple smoke effects, a long walkway down the middle, and the open concept made it so easy to believe we were out on the heath, or on the field of battle, or tagging along on the march of the trees of Birnam. Subtle lighting through the smoke conveyed the illusion of moonlight and did away with the traditional artificiality of indoor theatre. The silent mimes of the witch during intermission, crawling and creeping, scowling and scorning kept us immersed in the play, so we never took a break back to reality and lost perspective of where we were, which is often the case during intermissions. I usually have a fear when producers decide to lend a modern slant to a period drama that something will get lost. I hated Romeo and Juliet, for example (then again, maybe I just hated Leonardo). So I was a bit disappointed when I realized that they’d modernized this one too, instead of having them all in period costumes. I need not have feared. I was so pulled into the acting, and the script is so faithful to the original, that I forget all of this. The modern military uniforms, bicycles, and even appropriate use of pistol and mobile phone served to enhance, rather than detract, from the story. The phone camera photo to help the murders identify Banquo made sense, and the heart-stopping pop of the pistol, help drive home the violence of the murder against MacDuff’s own. I was pretty impressed by the stage and the creative use/ re-use of props. One metal scaffold used so effectively, and with such versatility we hardly noticed the lack of traditional scene changes. The use of a long walkway effectively extended the useable space, and allowed part of the action to take place within the audience. There were just a few changes that were inexplicable to me. First Patricia Toh, who does a mean Lady Macbeth, played a dual role as a person who saved Fleance and asked him to fly. No such scene exists if I recall correctly. I’m not sure if they were trying to highlight the potential for duality in each human being. “Methought I heard a voice cry “Sleep no more! If I did miss it I should probably kick myself. But oh, there were so many literary gems, so many timeless quotations! It’s incredible how many expressions these days are survivors from those centuries ago. Here are just some of my other favourite gems, which felt so good to whisper along during the live action. Now you know where this comes from! One of those archaic sentence constructs that paint such a beautiful picture, and speaks such a strong truth, in a way straight prose never can. 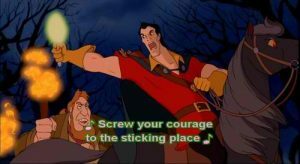 Now you know where this comes from, if you were ever puzzled listening to Gaston’s song to the villagers before they go kill the beast in Disney’s Beauty and the Beast. Exactly what I thought when I read the account of some of the executions of the old Iraq dictatorship. It was hard not to decry the evil that spilled from that regime, but it was also hard to dismiss these men as completely worthless, when they showed courage and equanimity before their executions. For all their sins, movie-stereotypical cowards they certainly were not. Ohhh, the language! Nothing more needs be said! All in all, an evening absolutely worth the time and money. The setting was perfect for a picnic spread, and I was lucky enough to get a great spot, thanks to arriving early ahead of a bunch of kiasu and potentially unpleasant people who I was able to completely forget once I got into the play. If you love Shakespeare in general, and Macbeth in particular, this is an immersive experience truly not to be missed. If you’ve puzzled about Shakespeare, you will start to understand the magic. If you loved the language, and have only ever just read the plays, like me, you will be thrilled and enraptured as you see scenes on a page manifest before your very eyes.